Trap-Neuter-Return (TNR) involves trapping feral or “wild” cats in humane traps, taking them to the vet to be vaccinated and sterilized, and then returning them to the place where they were originally caught. According to Alley Cat Allies, the national leader in work with Trap-Neuter-Return and feral cats, a feral cat is a cat that has lived his whole life without human contact and socialization. Feral cats can also be stray cats (formerly owned and human socialized cats) that have become lost or have been abandoned and who have lived so long without human contact that they have reverted back to a “wild” state. Feral cats are afraid of people and will avoid contact with humans. They cannot be touched by strangers. Stray cats because they once knew human companionship can be re-socialized and re-homed. Truly feral adult cats, however, usually cannot be socialized and are happiest living outside. Feral kittens, however, are another matter. If you can rescue feral kittens while they are still young (between the ages of 8-10 weeks is best), they can often be tamed and placed into homes. Estimates place the number of feral and stray cats living in Central Ohio at over ONE MILLION!!! Black & Orange Cat Foundation (or “B & O”) is named for two very special and very spoiled cats, Butler and Oswald. Butler, the “B” in “B & O” is the black cat in the group, while Oswald, the “O” in “B & O” is our orange feline. Although, we are especially fond of our black and orange cats (and, yes, we love those black and orange tortie mixes, too), we do not just help cats of those colors. We help all cats, no matter their shading. Both Butler and Oswald were adopted from the Union County Humane Society in Marysville, Ohio. Butler stole our hearts, when, after being released from his cage, he ran up his new mom's arm and perched atop her shoulder. Oswald, on the other hand, got our attention by screaming his head off until we finally came over and opened his cage door. Whereupon, there was no putting him back inside without suffering permanent hearing loss. While these two mongrels were adopted from our local shelter, the rest of the cats who have padded into our lives have come looking for us. Like the hobos during the Great Depression who marked “X's” on gates to let other hobos know where a kindly person lived who would give them a meal, these cats seem to have marked our homes to lead other unfortunate felines to our doors. Stray and abandoned, often very ill or injured, these cats led us to the idea of starting an organization to spay and neuter feral and stray cats in order to decrease the overpopulation problem and help cats who have no other angels looking out for them. Holiday shopping is easy with Amazon's Holiday Gift Guides. #StartWithaSmile at smile.amazon.com for your holiday gifts and Amazon donates to Black and Orange Cat Foundation. Support the Black and Orange Cat Foundation with every purchase from Res Q Threads. Check out the rescue apparel and accessories for you and your pet! Our cats love to sleep on Kuranda Cat beds, but we don't have enough for everyone. If you would like to donate a bed at a special wholesale price for another cat to sleep in comfort, please donate a Kuranda cat bed. Everyone please check out the wonderful "Collars by Katie." Katie is currently an employee at East Hilliard Vet Services and a vet student at Ohio State. Katie is offering to donate $2 per item sold (cat collars, dog collars, leashes, harnesses) to B&O through January and $1 per item thereafter. There is a spot on her ordering window online that asks "who referred you" so she'll know where the credit is due! So if you do order something, write in that you found out about Katie's wonderful items from B and O! And please support Katie! Every caged cat deserves a scratcher! Relieves stress and keeps cats exercised and entertained. You can order 6, 12, 25 or 50 scratchers per box and donate them to the Black & Orange Cat Foundation! Only $4.95 shipping for any size box! The Black and Orange Cat Foundation blog won the Best Writing Category in the BlogPaws awards? Halo, Purely for Pets and FreeKibble.com donated 5,000 meals of Halo's Spot's Stew to our kitties for winning! Read about all of the winners. 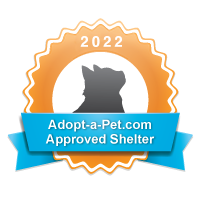 Buy Black and Orange Logo merchandise, as well as stamps featuring rescued kitties on our online store at Zazzle. We at SimplyCatBreeds.org are pleased to present the Black and Orange Cat Foundation with a Cat Rescue Award for excellence in helping needy cats who need a warm home and some love. Simply Cat Breeds takes pride in acknowledging the best organizations around the country with our special award, recognizing them for their outstanding work – the Black and Orange Cat Foundation is absolutely an organization we place among those that need recognition. Thank you for all the work you and your organization provide for cats in need. We know exactly how difficult and thankless a task it can be. We have discovered the perfect attire to wear with anything, even a kilt----your very own Black and Orange Cat Foundation t-shirt. You can buy one for $15 or two for $25 and if you send us a picture of yourself wearing the shirt, in combination with any ensemble, we promise to post the photo on our web site. Thanks to Brian for supporting us!! B & O Cats is enrolled in Kroger's Community Rewards Program. Kroger will distribute up to $1.25 million dollars per quarter to the organizations enrolled in the program. The amount earned will be based on the percentage of spending credited to each organization. You can help by registering for the program on the Kroger website. You will need your Kroger Plus Card number or phone number to register and must use the card/phone number when making purchases. Sign up for the Kroger Community Rewards Program now! To read about Fannie's continued story, search for the cartoons dated April 28 to May 2, 2009 on the Mutts Comics website.